English-speaking readers might be surprised to learn that Alain Badiou writes fiction and plays along with his philosophical works and that they are just as important to understanding his larger intellectual project. 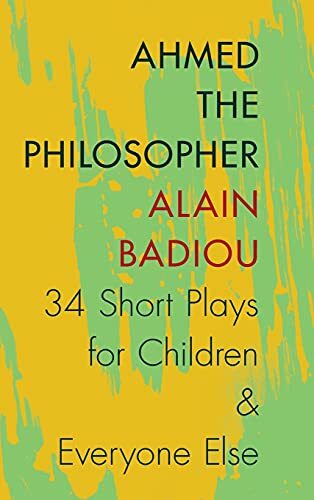 InAhmed the Philosopher, Badiou's most entertaining and accessible play, translated into English here for the first time, readers are introduced to Badiou's philosophy through a theatrical tour de force that has met with much success in France. Ahmed the Philosopher presents its comic hero, the "treacherous servant" Ahmed, as a seductively trenchant philosopher even as it casts philosophy itself as a comic performance. The comedy unfolds as a series of lessons, with each "short play" or sketch illuminating a different Badiousian concept. Yet Ahmed does more than illustrate philosophical abstractions; he embodies and vivifies the theatrical and performative aspects of philosophy, mobilizing a comic energy that exposes the emptiness and pomp of the world. Through his example, the audience is moved to a living engagement with philosophy, discovering in it the power to break through the limits of everyday life. Alain Badiou is a philosopher, playwright, novelist, political activist, and professor emeritus at the École normale supérieure in Paris. He has published many philosophical works, includingBeing and Event and Logics of Worlds, as well as the play Incident at Antioch: A Tragedy in Three Acts. Joseph Litvak is professor of English at Tufts University.